For everyone who calls themselves “a reader,” there is always one book — the book — that they can attribute to opening them up to the magic that can be found within literature. For me, that book was Little Women by Louisa May Alcott. As a young girl reading it through for the first time, I was completely immersed in this world laid out in front of me. Now, I’m ashamed to say that it has taken me about 12 years to re-read this classic, but to my absolute delight, I’ve found that the story not only holds up, but it has become ever more relevant to my life. 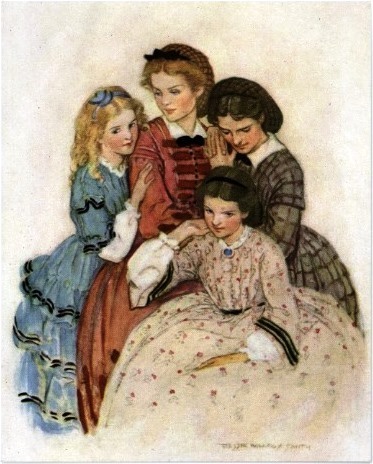 Little Women is the story of the four March sisters — Meg, Jo, Beth, and Amy. Living in New England in the late 19th century, these girls are forced to deal with many afflictions, including poverty, a father away at war, and the everyday struggles of becoming a little woman. The reader follows the lives of these sisters as they strive to better themselves and become the best they can be through their first loves, failed dinner parties, world travels, marriage and children, and other misadventures. The thing that caught my attention from the very beginning was the diversity of characters. Though the girls have the same rearing and are of a similar age (starting in the early teens at the beginning of the story), they are each so distinctly different. First, there is beautiful, proper Meg whose natural maternal instincts work to keep the other girls in line. Then, there’s “tomboy” Jo who cannot be bothered with feminine rules and instead writes stories, books, and plays. Next is tenderhearted Beth playing peacekeeper and hoping to please everyone. Finally, there’s artistic Amy who concerns herself with status and beautiful things. Each one easily visualizes the woman she wishes to become and sets goals from the very beginning to help attain that dream. While some are more successful than others, simply witnessing the journey is exciting, heartbreaking, and fulfilling. What I also love so deeply about this book is the way in which it is written. Some stories are written to convey the plot while others focus more on a moral, and still others, a feeling. Reading Alcott’s words, the reader can feel the absolute love that went into it. It’s hard to differentiate whether the love comes from the characters for each other or if the love comes from the author for them. Even minor characters never feel so minor. A character never shows up simply to move the plot along, but is rather thoroughly developed with good and bad traits, forming their own personality. You believe that they have been living their own life while away from the page and the lives of our beloved main characters. Every one of them is completely human.